what are xerothermic grasslands? | what are the threats to xerothermic grasslands? | how can we protect xerothermic grasslands? Xerothermic grasslands are herbaceous plant assemblages of a grassy or grassy-herbaceous character. The term "grassland" is commonly used to refer to a general assemblage of herbaceous plants, which is not exactly correct. There are other herbaceous habitats that do not have trees, such as meadows, but these are not dry grasslands. To simplify matters, an area of plant assemblages can be called a grassland if it includes species that developed in various extreme conditions, such as, for example, on a soil substrate with little water or organic matter (xerothermic and thermophilous) or a high salt content (salt grasslands), on soil with a high concentration of heavy metals (calamine grasslands) or strongly calcareous (chalk grasslands). 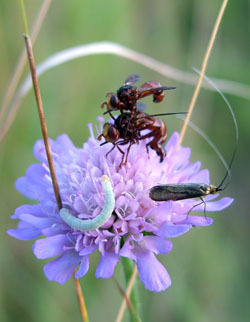 Xerothermic grasslands are primarily found in southern and southeastern Europe. In Poland, they are most frequently located on sunny slopes with a dry and alkaline substrate. Convenient sites may be hillsides, ravines, the steep slopes of river valleys, permanent talus piles at the base of chalk cliffs. Accordingly, the plants making up this type of phytocoenosis are photophilic and calciphilic. They have adapted to living in dry alkaline or neutral soils, rich in calcium carbonate but poor in organic matter and moisture. In Poland, these are most often partly natural habitats that developed in response to specific agricultural activities. For several hundred years, their establishment and maintenance in the landscape was connected to animal grazing or prescribed burning. Today, they are mostly wastelands. It should be noted here that in terms of ecological succession, grasslands are a short-lived stage on the way to a more complex set of plants, such as forests and shrubs. Xerothermic grasslands are therefore not a climax assemblage of plants. They dominated in our climatic zone after the last ice age, when they were able to take advantage of the vast expanses of unforested space. Then, over hundreds of years, they gradually succumbed to succession. Currently, the careful intervention of humans in the form of extensive grazing is needed in order for them to be maintained. The exception is only those grasslands, which exist in such extreme conditions that natural succession by shrubs and trees is precluded. An example of this is the upper montane area of the Tatra Mountains, where alpine calcareous grasslands exist. It should be remembered that plants adapted to many unfavorable habitats as the result of evolution and competition. Today, in an era of maximizing profits, fertilization and agricultural intensification, infertile land is not farmed. It is either afforested or abandoned. This is why sites that could potentially support this group of plants are systematically shrinking. Due to the many factors impacting their survival, xerothermic grasslands are among the most threatened plant communities in Europe. Despite their significant variety depending on the gradient of latitude and longitude, all xerothermic grasslands occurring in Poland are included in a common phytosociological group - the Festuco-Brometea class. This class includes plant assemblages of a semi-natural character (although this feature of xerothermic grasslands is questioned - see the discussion below) growing in dry habitats having a high proportion of calcium. The species' composition, structure and function of a xerothermic grassland are determined by many factors, among the most important being: habitat characteristics (the physical and chemical properties of the soil, for example), climate conditions of a given region, landscape structure, features of the terrain and others. An important but relatively poorly known element influencing the ultimate configuration of a grassland is also the history of how thermophilous flora dispersed in Europe. Due to the variability of the factors just enumerated, xerothermic grasslands are not homogenous habitats and exhibit significant variability in Poland. An attempt to classify the main sub-types of natural habitat 6210 - xerothermic grasslands - that occur in the country led to the distinction of four main groups of vegetation. Before presenting these four sub-types, it is worth noting that this division, as with many other divisions and classifications of the living world, is not precise or clear-cut. The great diversity and variety of the components comprising xerothermic grassland habitats, as well as the many factors influencing them, mean that they are constantly changing according to the gradient of environmental conditions. For this reason, any ascribed categorization is a certain simplification and cannot be precise (in other words, we can easily find a patch of vegetation whose affiliation to a distinct phytosociological group is open to discussion). Flowering grasslands are found on various types of soils (for example, rendzinas, pararendzinas, brown soils and chernozem), more rarely on sandy soils, which differentiates them from Stipa grasslands. These are the most species rich xerothermic plant assemblages. Many hundreds of vascular plant species occur here, most with a showy inflorescence that gives the xerothermic flowering grassland its unique character and separates it from the remaining sub-types. The vegetation of a flowering grassland, compared to the other sub-types, is often very rich, lush and abundant, so a less experienced observer could mistake it for a meadow instead of a xerothermic grassland. 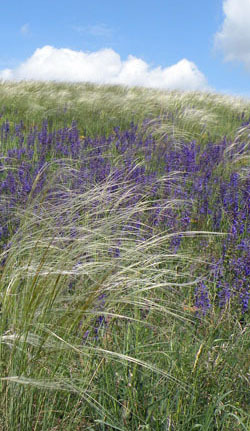 Flowering grasslands grow in locations with good exposure to the sun and a low soil moisture content. However, their occurrence is most often not associated with such extreme abiotic conditions as is the case with, for example, Stipa grasslands. They can occupy areas that have somewhat higher quantities of moisture and organic matter, which in large part determines their species' composition. Flowering grasslands are a short-lived sub-type of xerothermic grasslands in their ability to sustain the open character of the vegetation without appropriate interventions. Because of the habitats they occupy (less extreme than Stipa and calcareous grasslands), unused flowering grasslands often quickly degenerate in the direction of a meadow or forest phytocoenosis. Stipa grasslands are associated with various types of soils, including poor, sandy soils in extreme cases. They are an assemblage that is somewhat poorer in terms of species richness compared to flowering grasslands. A characteristic feature of the vegetative structure in Stipa grasslands is the occurrence of tussock grasses, with narrow and often glaucous-tinged leaves. The most important species with such a physiognomy are the grasses for which this sub-type is named, of the genus Stipa (several species occur in Poland). Another significant distinguishing characteristic of Stipa grasslands is the often less dense growth of the vegetation, which is reduced when compared to flowering grasslands. The extreme abiotic conditions result in a lower density and biomass of Stipa grassland vegetation, with patches of bare ground clearly visible. Stipa grasslands mainly develop in locations with unfavorable environmental conditions, such as steep inclines (for example, river valley slopes, including very steep escarpments undergoing erosion by river currents), unstable substrates, low soil moisture, strong exposure to sunlight, etc., which most plant species cannot tolerate. 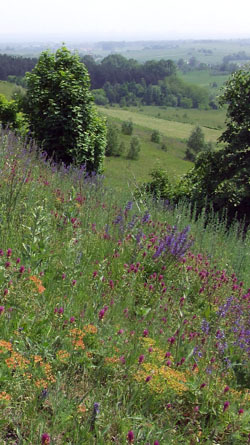 An important characteristic of the habitat is the appropriate exposure of the slope: it must be to the south or close to south, which ensures extensive exposure to sunlight and a heated soil surface. Only highly specialized species can survive in these types of habitats, and this determines the specific species composition and spatial structure of Stipa grasslands. 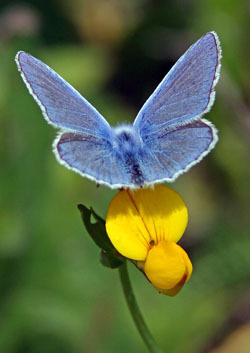 Calcareous grasslands include pioneer plant species that develop on the outcrops and steep walls of chalk cliffs. Calcareous grasslands most often are comprised of small patches of tussock grasses, growing in very low densities resulting from the specific habitat characteristics. 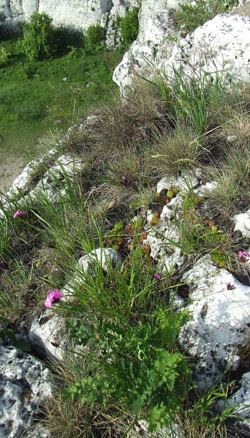 The plants sprout and survive only in crevices and cracks of the cliff rock, with the remaining grassland fragments deprived of vegetation. They occur on slopes with various exposures, which influence the type of xerothermic plant species in the assemblages. Thermophilous fringe vegetation is a category of plants growing in the transitional zone between typical xerothermic grasslands and assemblages of shrubs and forests. Because the occurrence of thermophilous fringe vegetation is often limited to a narrow band between a forest and open terrain (most often a grassland), they can form long and narrow patches, and their boundaries in relation to neighboring assemblages can be difficult to distinguish. The character of this type of vegetation is very variable and is determined to a large degree by the influx of plants from the surrounding habitats. A characteristic feature of thermophilous fringe vegetation is the occurrence of many creeping plants determining the spatial structure of the assemblage.